Last week, we took the kids on a day-long fieldtrip to Reed School, a historic, one-room school house east of Neillsville in central Wisconsin. The day involved the kids – and adults – reliving what a typical school day was like in 1939. As we sat in the old-time desks with holes where ink wells used to be, learned about the history of the school and watched as the kids went through their lessons, I discovered several key lessons that are still relevant today. For one-room school houses, the community was extremely important: the school needed their support to operate and school was a center of community activity. 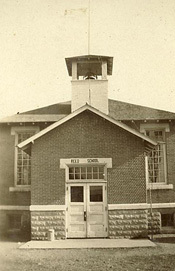 For Reed School, the community came together to rebuild the school within 8 months of it burning down in 1915. An incredible feat, since the new, almost 2-story building was build of concrete and brick — and they didn’t have the construction equipment we have today. The new building then served not only as a center of education for their children, but parents and neighbors were so deeply involved that the school became a center of community life. Parents and others gathered for regular school performances and other activities while also working together to maintain the building. Children in a one-room school spent their days surrounded by children of all ages. At various points in the day students could find themselves being challenged by a lesson with an older student, and at another, mentoring a younger schoolmate. With just one teacher required to teach lesions to a large group of students of all ages, such cooperation was essential. It also served to ingrain learning into the students, because in order to mentor another child, you must know that specific material extremely well. Students had to literally work for their education. In addition to having to walk two miles or more to school (which often provided lessons of its own), the students had to help haul in the water, take care of the coal stove, clean the blackboards and perform a range of other chores essential to the operation and upkeep of the school. These responsibilities, I think, helped instill pride in their school and offered chances for responsibility. Lessons in a one-room school were not locked into a certain grade level or age. Rather, they could be given according to ability and students were permitted to learn ahead or listen in on lessons on which they needed to catch up. Reed School, built in 1915, served as a one-room country school through 1951. It provided a first- through eighth-grade education with only one teacher. The school is typical of the more than 6,000 one-room schools that dotted the landscape of rural Wisconsin. For more information about the school call 608-253-3523. When you’re right you’re right. The one-room schoolhouse is indeed an example of a working principle that is designed into the prototype and quickly gets lost from there. I’d wager those schoolkids learned more about life and business from that humble little schoolhouse than most grad students ever will come away with. Thanks for blogging about real stuff that matters, Tim. If we who know how don’t use it for good and righting wrongs along the way, we aren’t good for much. If you get a chance, pop over to my personal blog and comment if it takes your fancy and you have something to say. The post is about John Moore, yet another company who has no regard for the kind of community values you expound here. Oh, and keep posting these little gems of wisdom, Tim. I’m inspired to revitalize my own personal blog a bit and link to this as an example of blogs that perform a purpose.